When applying for a nonimmigrant visa, you should upload a digital photograph taken within the last six months as part of completing and submitting the Form DS-160. You should also bring a copy of your photograph to the U.S. Embassy on the day of your interview. You will also be fingerprinted when you arrive for your interview at the U.S. Embassy. Your visa application photo must meet certain criteria regarding size and content. Submitting photos that do not meet these criteria can delay the visa application process. To reflect your current appearance, your photo must be taken within the last six months. If your photo does not meet the requirements, you will be required to submit a new photo before your visa is processed, even if the visa application system accepted it as a digital photo upload. Make sure your eyes are open. 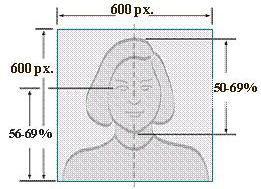 Your eyes should be 2/3 of the way up the photo, or between 1-1/8 inches to 1-3/8 inches (28 mm and 35 mm) - about 60% - from the bottom of the photo. *Starting November 1 2016, applicants are not permitted to wear eyeglasses in photos.